Richmond, Baltimore, Philadelphia, and New York City all have museums dedicated to Edgar Allan Poe. However, New York City goes above and beyond these other cities in memorializing this great American author. Poe was born in Boston in 1809 and first arrived in New York City in 1837. He came with his wife Virginia and mother-in-law Maria, but only stayed for a few months. During that time Poe lived on Sixth Avenue and Waverly Place and 113 1/2 Carmine Street. In 1844, after spending some time in Philadelphia, Poe returned to New York City with his wife. During this sojourn, they first stayed in a boarding house located at 130 Greenwich Street before moving to a farmhouse owned by the Brennen family. The Brennen Farmhouse was located in the vicinity of what today is West 84th Street and Broadway. While living there, Poe wrote his most famous work, “The Raven.” “The Raven” was first published with Poe’s name in The Evening Mirror where Poe worked as a critic. The Evening Mirror Building, 25 Ann Street, is currently a residential building and was rechristened the Edgar House. There is a plaque memorializing Poe in the building, however it is inaccessible to the general public. For “The Raven,” Poe was inspired by the farmhouse and Mount Tom, a rocky outcropping located just inside of Riverside Park off of 83rd Street, which Poe named after the Brennen’s young son. The room described in the poem is thought to have been based upon Poe’s chamber in the farmhouse where he wrote the poem. The mantelpiece from that room, known as the Raven Mantel, was saved from the farmhouse’s destruction in 1888 and was presented to Columbia University in 1908 along with documents attesting to its authenticity. For a fascinating look at the history the Raven Mantel, how the author rediscovered it while researching this article, and its current whereabouts, check out “Mystery of a Poe Relic: The Raven Mantel’s Curious Journey” in The New York Times. Currently, there is a dispute as the exact location of the Brennen Farmhouse. A competing claim, which sets the farmhouse on the East side of Broadway and 84th Street, at 215 West 84th Street, appears in the form of this plaque located on the Eagle Court Apartment Building. 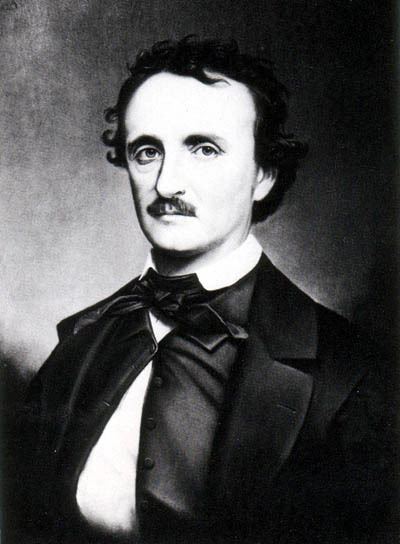 In 1980, the City memorialized Poe’s presence in the area by renaming West 84th Street, from Riverside Drive to Broadway, Edgar Allan Poe Street. Additionally, Edgar’s Cafe, which was formerly located on 84th Street and Broadway, was also named in Poe’s honor. Poe was also honored, to some extent, with a street named after him in the Bronx near his Fordham Cottage. However, Poe Place appears to be more of an alleyway and does not possess any street signs. Poe only remained on the Upper West Side for a few months and lived a transient lifestyle for the next couple of years. In 1845, Poe lived at 154 Greenwich Street, 195 East Broadway, and 85 Amity Street (which became West 3rd Street). Towards the beginning of 1846, Poe moved to East 47th Street near the East River. But within a few months, Poe was on the move again. This would be his final move in New York City. In May of 1847, Poe leased a small cottage in the Fordham section of the Bronx (at the time it was Fordham Village in Westchester County) for $100 a year from the Valentine family. While living the Bronx, Poe published “The Cask of Amontillado” and wrote some of his most well known poems including “The Bells,” Annabel Lee,” and “Eureka.” “The Bells” is thought to have been inspired by the bell at St. Johns College (which became Fordham University). The University is still in possession of the original bell which the class of 1939 renamed Old Edgar Allan in Poe’s honor and placed a plaque commemorating Poe on the facade of the university church. Old Edgar Allan is currently kept in a safe and is not on view to the public. One of the reasons Poe moved out to the Bronx was for the sake of his wife. Virginia had contracted Tuberculosis and at the time fresh air was thought to improve, if not cure, the disease. Sadly, the Bronx did not provide the miracle that Poe was looking for and in 1847, Virginia died in the cottage. Two years later, when Poe died under mysterious circumstances, Maria Clemm, Poe’s mother-in-law was left in the house by herself. Unable to afford the rent she sold or gave away many of Poe’s possessions and the furnishings of the house. Poe Cottage, which is currently located in Poe Park Most of the furniture was not original to the house except for the rocking chair, bed, and possibly a mirror The original bed in which Virginia Poe died Sculpted by Edmond Thomas Quinn, this bust of Poe was presented to the City in 1909 by the Bronx Society of Arts and Sciences. It was commissioned to commemorate the 100th anniversary of the Poe’s birth. Originally located in Poe Park, the sculpture was relocated inside the Cottage due to vandalism. Between Poe’s death and 1910, the cottage went through a number of different owners, some of whom hoped to save it from destruction. This protection was achieved when the decision was made to move the cottage to a newly created park. The park, named in honor of Poe, was dedicated in November 1913. Due to its location, the cottage suffered much vandalism over the years but its designation as a New York City landmark in 1966 ensured that it was to remain for future generations. The cottage recently completed a thorough restoration, during which it had been closed to the public. During that time, some of the items from Poe Cottage were on view at the Valentine-Varian House as part of an exhibit entitled “Edgar Allan Poe — The New York Years.” There was also an interesting and informative film on Poe which you can watch at the Valentine-Varian House or online. Both buildings are currently administered by the Bronx County Historical Society and the New York City Historic House Trust. In 1910, Poe was inducted into the Hall of Fame of Great Americans located in nearby University Heights. As part of the third class of inductees he beat out such luminaries as Alexander Hamilton, Mark Twain, and James Monroe who had to wait another five to twenty years for their own inductions. Memorials to Poe abound in New York City and those in the Fordham section of the Bronx alone (Poe Cottage, Poe Place, The Edgar Allan Poe School (PS 46), and even a mural gracing the Grand Concourse) display the celebrity treatment which Edgar Allan Poe has received in the City. Without a doubt, Poe’s star is still shining bright. Years ago… In The Fordham Section of The Bronx, just a abiut a block and a half from The Poe Cottage… a small One Bedroom cottage stood forgotton between two tenament buildings. It was kept up by an elderly lady that lived there for years. One day, a Member of The Bronx Country Historical Society, and a Direct Distant Cousin to “The Poe Family” was in The Research Library, overlooking an oid map of Fordham, dating back to the mid 1850’s+ with another BCHS Member, who was doing research on Edgar Allan Poe and “The Poe Cottage”. While overlooking this map, it showed along with their residence/owners names, other buildings and structures in the surrounding area. As they were looking for “The Poe Cottage”. They noticed the name “Clemm” showed on one particular structure. The Name “Clemm” was the maiden name of Virginia Clemm-Poe and Edgar’s Mother-In-Lawm Maria Poe-Clemm. The excitement of finding this fact gave cause to look deeper and upon visiting the original location… the forgotten “Clemm Cottage” was rediscovered. Approaching the elderly woman living in the cottage, they introduced themselves and asked about the cottage where she lived? In the back of the property, there was a small derelict shed and a rotting rowboat on top. When they asked her that this was “The Clemm Cottage”… she smiled and said that they were mistakened. A few years went by and Poe’s Cousin got married. Looking for a place, they were lead to a lovely Two and a half bedroom apartment. In queer happenstance… the tenament happend to be next door to “The Clemm Cottage”. Going with his gut feelings… he told his lovely bride about years before about re-finding “The Clemm Cottage”. His bride thought the this was ‘A Sign’ and perhaps he was right about the location. Due to her advancing age… the elderly Woman relocated, and “The Clemm Cottage” stood vacant. In vain, The Poe Cousin tried to them interested parties who he was and unfortunately they didn’t believe him, thinking that he was making stories to somehow live there, when in fact the property was sold to someone that was more interested in the property then in an old rundown looking cottage. Due to the times and the lack of funding… even the idea of saving “The Clemm House” and having moved to Poe Park and having Both cottage next to one another… the new owner desided to bulldoze the cottage. It was a total loss. Asking why this was not brought up before, he said, the elderly Woman didn’t want people to inquire or bother her”. It would seem that she forgot to tell the new owner too? To confirm the story of The Poe Cousin, I first thought that he might have been related to Frances Sargent Osgood, good friend’s with The Poe’s, by way of “The Locke Family”. When I went to http://www.geni.com and checked compared The Poe Cousin’s Family charts to Edgar Poe’s Family charts, I was surprised to discover that it was all true! I am now in possession of photos of “The Clemm House”, The next door Apartment building and the Charts of “The Poe Family” and Poe’s Direct Cousin. The restaurant Il Buco, in NoHo, claims that it’s wine cellar inspired Poe to write “The Cask of Amontillado”. Any truth to this? There do not appear to be any statements from Poe stating where he found inspiration. In addition to the restaurant, Poe House in Philadelphia claims to have inspired Poe’s setting (as well as numerous other locations) so it is impossible to ascertain legitimacy of any of these sites. Loved the mantle story re; Poe’s Raven….I am Col. Hemstreet’s great, great granddaughter…would love to chat and am curious as to what put you on to this? Hope to hear from you. Great post—Boston should pay due reverence to Poe as well!